Borland Bluffs is the general term for the complex series of cliffs which exist on the north facing slopes below point 1498 off Eldrig Peak. Find your way to the Borland Lodge. Mark the odometer at the gate into the park and drive 9.5 km along the dirt road. Park at pylon #89. Eagle Rock and the Upper Bluffs should be visible from the road. Follow cairns towards the creek and into the forest on the true left. Then climb the spur (and tape) next to the creek before veering right away from the creek. Continue steeply on taped trail passing most difficulties on the left. A fixed rope leads onto the rocky ridge. It's another 10 minutes to the cliffs. There is space for 2 tents on "Puke Point" and the Borland Bivvy sleeps 5-6 people (four comfortably). The cliffs are a stones throw from the bivvy and Puke Point. This climb ascend the obvious crack systems on the low angled face of The Finger. It can be done in one long pitch or broken in two below the true summit. It's an adventurous route with good gear. Crack climbing skills are required or up the grade by 2. Open Project. 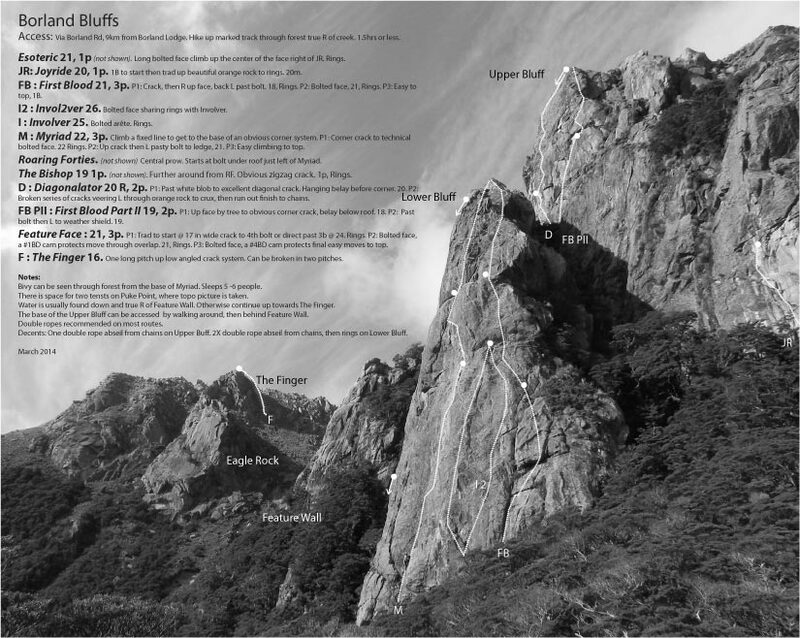 The obvious flake feature on the arete of Eagle Rock has had several attempts. Good gear throughout. Very physical climbing! Fuzz Wall is around and up from Feature Face. It's the first, aptly named, fuzzy face with several crack lines. Cuz, It's Fuzzy attacks the clean, white face crack visible from the ground. From the ground, the upper climbing appears to go through a vertical lawn of lichen, but once on the wall is enjoyable. Continue out right to a grassy ledge and rings. A full value pitch. Steve Skelton, Danny Murphy, 2015 : Ground Up. P2, 31m, Grade 18, 6Bolts plus gear. From anchor step left and climb through dihedral and then up the prow to DBA. 3 Pitches. Feature Faceoffers sustained, technical face climbing on awesome features up to the highest point of the wall. Now fully bolted, the route originally climbed a flake which has since fallen off. Subsequently there are two starts, the left is up an awkward crack, the right is one face move at grade 24. P1: 17. For a good warm up, lie back the wide crack past two bolts before gaining good feet out right at the third bolt. continue through nice features to a ring anchor below the roof flake. Otherwise start the face direct past three bolts and a 24 crux (FFA Troy Mattingly, Feb 2014). P2: Awesome, sustained face climbing! Make a long, delicate move past the first bolt to gain the roof flake. Crank on through past crimps and slopers, through continuously interesting and delicate climbing. Keep your cool to the belay at a tussocky ledge. 21. P3: Easier climbing past several bolts to cruxy move (18). A single bolt exists on top of the formation for belay. (18). Decent: Rap from the second pitch. Otherwise, to access the upper bluffs walk down to the north, then west across tussocky terrain to the westerly ridge. A good sport link is to continue up equilibrium. Follow the gully down to the east, climbers left to base. Steve Skelton, Shana Payne, 2012. Obvious zigzag crack left of Roaring Forties. Apparently there are some face holds. Rings. Clip first bolt off the belay. Then it's an adventure climb following discontinuous cracks, generally tending rightward to chain anchor. Double set of cams and a #5. Steve Skelton, Reese Doyle, 2010 : Ground Up. Amazing climbing on solid rock with varied styles. Originally climbed up the crack, then out to Roaring Forties, the FA team returned to continue up the continuing corner, ground up drill in hand. A single rack of cams is required. Climb fixed line to belay in a tree at the base of a wide crack. P1 : Belay off tree, atop stripped rock below obvious corner crack. Follow off-width crack to small rooflet, then into finger crack. Soak it up through stunning moves until crack angles out left. Here you can bail out left to rings for a stunning grad 17 pitch. Otherwise, continue up corner feature, bridging past bolts and a few gear placements. Move out R onto face and paste yourself to the rock through the delicate crux. Hang on till the rings. 22. P2 : Take the crack directly above. When the crack ends, load it up with gear and step L to a runnel and a bolt. Continue up to ledge and a trad anchor. 21. P3 : (First Dud) Moderate climbing past a few pitons to summit. 14. Superb techy climbing on wall between Involver and First Blood. The arete between Myriad and First Blood. Sustained technical, [involved] granite wall climbing at its finest! Note that this route really is 28m long. You need a 60m rope to get down, don't try with a 50. P1 : L tending crack to soft white flake. Then get into the DIAGNOLATOR! Trad belay. 20 P2 : Up R tending flake, to weakness. Follow R facing crack to half way, then step L to orange patina face. Run it out to the chains! 20 R.
P1 : Climb the obvious crack to trad anchor in cave. P2 : Up R past 1 Bolt. Stay true to ridge past some beautiful wind polished rock. Climbs cracks in beautiful orange rock to rings. A must do! cams to #1 and doubles in finger sizes would be handy. adjective : intended for or likely to be understood by only a small number of people with a specialized knowledge or interest. Starts on loose ground to gain first bolt. The climbing then weaves its way across dykes and patinas to the top. Rings. Walk down track from Bivi for 5 minutes. Just before you veer right down a slippery slope, turn left instead. Follow orange tape west on rough track, cross stream. Walk up hill for 50mtrs or so. Climb past 1 bolt to gain sweet gain fist crack. Rap off tree at top. Jimmy Finlayson. 31.10.2015. Ground up.